We remember Theodore Roosevelt as the 26th President of the United States who fought monopolies, added to the national forests, solidified construction of the Panama Canal, and has his likeness carved into Mount Rushmore. He rose to the presidency after President William McKinley was assassinated, but the story of his physical ride to office is a spectacular tale in its own right. President McKinley was visiting the Pan-American Exposition in Buffalo during the height of an anarchist movement that emerged from resentment of the wealthy by the poor. McKinley was shaking hands at a meet-and-greet when he was shot twice by Leon Czolgosz, a member of the anarchist movement. At the time of the shooting, Vice President Roosevelt was at Isle La Motte on Lake Champlain enjoying a luncheon with the Vermont Fish & Game League. He immediately left and traveled to Buffalo to be near McKinley. After a few days, McKinley's condition stabilized, and a surgery to sew up the bullet holes appeared to be a success. It was thought that Roosevelt's presence in Buffalo would make the public worry about the President, so he was encouraged to leave. 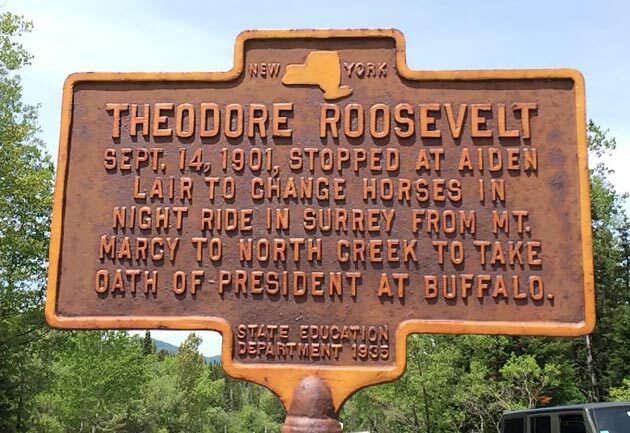 Roosevelt left Buffalo and traveled to the Tahawus Club near Newcomb, NY in the Adirondacks. Unbeknownst to Roosevelt, McKinley's condition took a sudden turn for the worse. Roosevelt was climbing Mount Marcy in the Adirondacks when a message was sent to the Tahawus Club to alert him of the news. Club guide Harrison Hall was sent to find Roosevelt and give him the message, which he did. 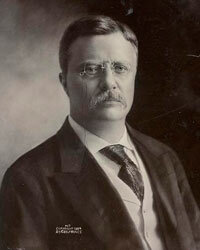 Roosevelt then returned to the Tahawus Club where he rested up and prepared to once again travel to Buffalo. Around midnight, Roosevelt grew restless from waiting and decided to begin the journey, even against the advice of others at the Club. 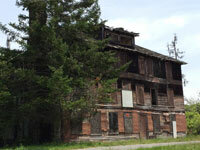 His destination was North Creek Train Station; a 35 mile trip that would take at least 7 hours in daylight. Roosevelt set out with a driver in a buckboard wagon and traveled 10 miles to the Tahawus Post Office to change wagons and drivers. Nine miles later, he stopped at Aiden Lair Lodge (pictured right) to again change his surrey. Aiden Lair proprietor, Mike Cronin, took over the driving duties and accompanied Roosevelt the rest of the way to the train station. The duo made the journey in record time, arriving in North Creek at approximately 4:45 am. It was at the train station that Roosevelt received word of President McKinley's passing earlier that morning. Upon hearing the news, Roosevelt proceeded immediately to Buffalo on the fastest train. After arriving in Buffalo, Roosevelt stopped at the house of Ainsley Wilcox to freshen up. The Cabinet wanted his inauguration to take place at nearby Milburn House where President McKinley's body lay, but Roosevelt refused out of respect for the President. He traveled to Milburn House to pay his respects to McKinley and his widow, then returned to Wilcox Mansion for his inauguration. Roosevelt was sworn in in the small library of Wilcox Mansion with approximately 40 people in attendance, but no actual photographs of the occasion exist.